Woof’n Rose makes red wines from fruit grown in the Ramona Valley AVA, most of the fruit is estate grown on the premises. Varietals include Cabernet Franc, Cabernet Sauvignon, Merlot, Malbec, Petite Verdot, Grenache Noir, and Alicante Bouschet, as well as proprietary blends comprised of these varietals. Woof’n Rose also makes one white wine, an Albarino, also from Ramona Valley fruit. 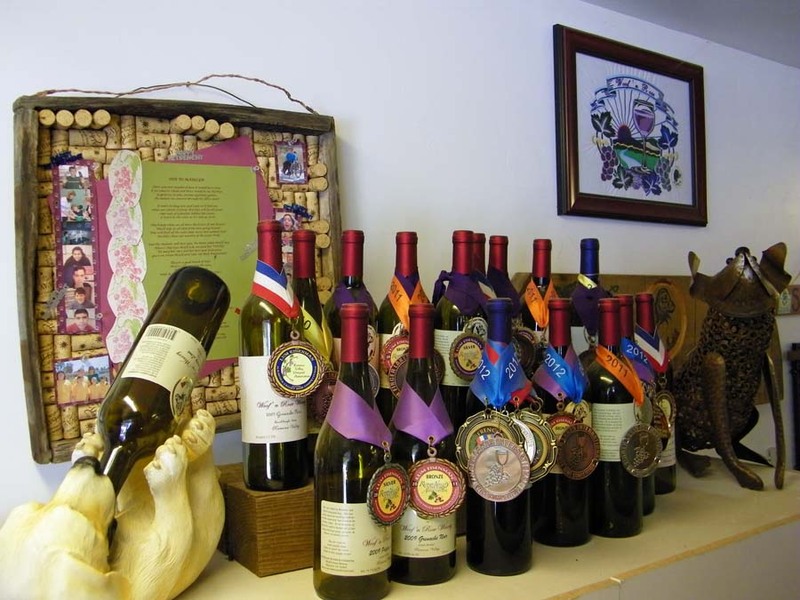 Many of these wines are medal award winners from wine competitions such as the Fingerlakes International, the San Francisco Chronicle, The Florida State Fair, and the Toast of the Coast (San Diego County Fair commercial competition). 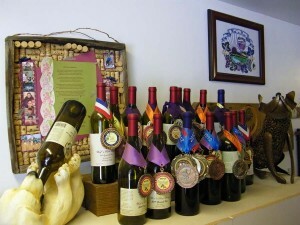 Medal positions are listed with the wines, excepting new releases which have not yet been in the competitions. Woof’n Rose Winery invites you to: Please sip our wines in your quality time, Time to smell the roses, Time to kiss puppy noses! All Woof’n Rose red wines are made from 100% Ramona Valley grapes. Our 4th year producing a white wine made totally in stainless steel. The Albariño grapes came from our neighbor’s vineyard at Hacienda de las Rosas. A bright summer wine with notes of lemon, grapefruit and crisp citrus nose and palate. This delightful wine will pair well with seafood, oysters on the half shell and a hot summer’s day! Wonderful nose of vanilla and allspice. Well balanced with pleasant tannins and hints of leather and cherry. Great with firm white fish, turkey, and grilled salmon, or spicy foods such as Mexican or delightful without any food. Dark chocolate, cherry, cinnamon, and blueberry in both the nose and palate. Well balanced, smooth, with light pleasant tannins and lovely color. Pairs well with roasted meats and chocolate cake. Coffee, toffee, and vanilla nose. This lovely soft wine has a hint of Ranier Cherry. Pairs well with duck or elk (especially with a blueberry reduction sauce), chili relleno, cinnamon bagels, and/or apple pie alamode. Our newest edition of our flagship wine. Dark cherry and mineral notes in the nose. Nice acids and tannins which make this lovely wine age worthy. A lovely elegant finish. Great with steaks and game meats. Hints of oak on the nose. This complex wine is wonderfully balanced with a lovely mouthfeel and delicious fruit. The long finish will have mellow tannins with hints of plum, cherry, and vanilla. Could be paired with eggplant parmesan, robust Italian dishes, or enjoyed all by itself. Have fun pairing it with your favorite dishes. Chocolate, toffee, toasted caramel & cherry. Light tannins & good acid balance make this a well-balanced, full-bodied wine with delightful mouthfeel & finish. FairSpicy, mineral notes in the nose. Lots of bright dark fruit such as plum & cherry in the front pallet with light tannins in the middle followed by a long, lingering finish. Pairs well with dark meat poultry, duck, & rabbit. A pleasant bouquet with cherry & light tannin in the pallet. A wonderful, smooth, well-rounded every day wine to be enjoyed before dinner with an aperitif or anytime. Great with steaks, turkey, roasted chicken or any meat. This is our first offering of our Estate Malbec. There is a hint of cracked pepper in the nose with vanilla & ripe fruit in the pallet. Lovely dark ruby color. Pair it with lamb or goat. Old-World style wine with lovely fruit forward notes of spice, popcorn, & raspberry jam in the pallet. Smooth tannins & a delightful finish. Enjoy it with seared foie grois, pate, &, just for fun, popcorn. This year’s blend is an elegant offering with a delightful nose. It is well-balanced with beautiful fruit, wonderful tannins & a long finish. To describe this wine as full-bodied with a mouth full of fruit would be an understatement. Black fruit with hints of violets & blueberries which continues all the way through the finish. Smooth, soft tannins making this a lovely, well-balanced wine. This is the wine you would want with elk tenderloin with rosemary, any game with blue cheese, steak, prime rib with mushrooms, perhaps even roasted chicken. Great fruit, nice tannins, good balance & smooth finish describes this beautiful wine. As all its predecessors, it has a wonderful, velvety mouthfeel. Delicious with steaks, beef stroganoff, & even the humble hamburger. Truly a fruit bomb from beginning to end with. This huge wine would pair well with Greek dishes, dates, figs, ramaki, baklava, blue cheese & other full-bodied cheeses. Bright ruby color with a spicy nose. Wonderful whole mouthfeel with notes of dark berry fruit, caramel & cherry. Delightful long clean finish. It is not over the top sweet, but just perfect with a clean finish. Relax on a cool, winter’s evening with a glass or enjoy it with your dessert or robust cheese. The best way to describe this wine is YUM!!! Great as an aperitif, with dessert or a good book! Neuf Anges a sweet, fortified wine, with a lovely clean finish made from our Estate Grenache Noir. Enjoy it before your meal over ice with a twist of lemon, served at room temperature with dessert, or with a good book. Pairs well with fresh fruit, dark chocolate, fig cake or robust cheeses. You will find lovely notes of tropical fruit in this delightful Chardonnay. Aged completely in stainless steel the fruit comes through beautifully. ENJOY! This Chardonnay comes from the Santa Yanez Valley and is not a Ramona Valley wine. Since we produce only red wines, we feel that we should offer a white wine to our guests who only drink white wines so they can participate in the wine tasting experience. This Chardonnay is only available for by the glass or bottle and is not part of our regular tasting.